How do CryoDerm Ingredients Work? CryoDerm products relieve pain by breaking the Pain-Spasm Cycle. 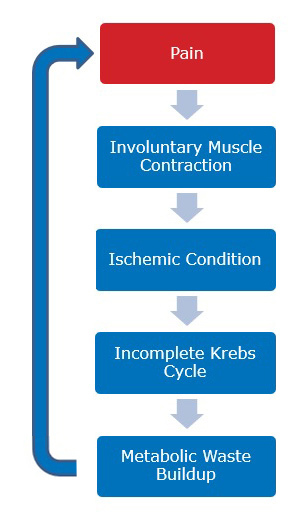 This is a physiological cycle in which sensations and cognitions of pain from injury cause spasm in the nearby muscles. The spasm causes several other reactions in the body which in turn create more feelings of pain. This cycle continues indefinitely unless broken. The following diagrams explain how the Pain-Spasm cycle occurs without intervention, and how the cycle is broken using CryoDerm. (1) When we are injured, a pain signal is sent to the brain to communicate the injury. (2) This pain signal causes the muscles in the area of injury to involuntarily contract and remain contracted as a guarding mechanism. (3) This sustained contraction causes an ischemic condition (decreased blood flow and oxygen supply) as well as decreased lymphatic drainage. (4) The lack of oxygen in the area means that energy production using oxygen (Krebs Cycle) cannot be completed. (5) This causes a buildup of metabolic waste products including lactic acid. (6) The buildup of waste products creates more pain signals and cramping, which begins the cycle again. (1) CryoDerm offers a cold sensation to counteract feelings of pain. The peppermint and other ingredients activate The Gate Control Theory, in which CryoDerm’s cold signal beats the pain signal to the brain. (2) Without the feeling of pain, the muscles can release their contraction, (3) allowing blood and oxygen to flow back into the injured area. 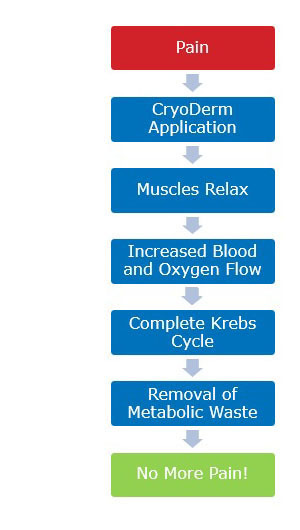 (4) With oxygen, energy production through the Krebs Cycle can continue, (5) and the venous and lymphatic drainage systems can work to remove metabolic waste buildup. (6) Without the buildup of metabolic waste, the feelings of pain decrease, and the cycle has been broken! CryoDerm ingredients work as a team to provide pain relief through cooling or heating sensations while the Magnesium Calming Cream offers its own benefits for relaxation. Below is a list of some integral ingredients in our products and their actions. For a full list of ingredients, visit the product page you are interested in and choose the “Ingredients” tab in its description. CryoDerm’s menthol is steam-extracted from peppermint. The vapours extracted form a waxy-crystal substance which is pure menthol. These crystals are then dissolved into the liquid product. No chemicals or heavy metals are used in this process. Not all menthol is created equal. Other analgesics use synthetic versions of menthol derived from Coal Tar, which is a by-product of coal processing. Other products may use other plants such as Thyme leaf in which the menthol crystals are extracted using a mixture of chemicals such as propene or acetone. These synthetic versions form a different strain of menthol, proven to be less effective than pure menthol from the peppermint plant. MSM is a naturally occurring essential nutrient found in human tissues and joints, plants and animals. MSM aids in opening the pores to allow the product to pass through the skin’s layers and penetrate deep into the joint. When applied, it creates a tingling sensation. Part of the sunflower family, Arnica is known as an anti-bruising agent and helps reduce swelling and contusions. Also known as Indian Frankincense, an herbal extract from the Boswellia Serrate tree. Used in Asian and African folk medicine to reduce inflammation and improve mobility to relieve pain. Derived from holly, used in herbal remedies to help reduce swelling and loosen stiff joints. Derived from steam-distilling dried eucalyptus leaves. Has warming properties and is anti-bacterial and anti-inflammatory in nature. Water that has been purified through a reverse osmosis process to ensure it is chemical-free. Peppermint creates a burning-cold sensation. It has anesthetic properties, and acts as a vascular and lymphatic system stimulant. The salts used in this product are harvested from the southern end of the Dead Sea where the mineral content of the water is at its highest. The salts and minerals in the cream occur naturally in our bodies but must be replenished regularly as they deplete throughout the day. Historically, Dead Sea salts have been used to treat a variety of conditions such as back and neck pain, joint pain and swelling, sore, stiff, and tight muscles, irritated nerves, arthritis, rheumatoid arthritis, psoriatic arthritis, osteoarthritis, bursitis, tendinitis, plantar fasciitis, and neurological conditions. Essential for cell metabolism, improves muscle cramping by calming the muscles, aids in nerve irritation, contributes to a sound sleep and reduced stress. Helps maintain heart rhythm, muscle function, strengthens cell membranes, and plays a key role in bone health. Important for nerve signaling and muscular contractions. Helps maintain blood pressure and fluid volume. Helps regulate fluid balance, nerve signals, and muscular contractions. The third most abundant mineral in the body. An essential component of an antioxidant detoxifier. Essential for the thyroid gland to produce hormones which affect many body processes. Known to aid the immune system in fighting bacteria and viruses. Internally, it is a key factor in creation of genetic materials in cells. Act to maintain regular functioning of the body. Deficiencies may impact the thyroid gland. CryoDerm is proud to use ingredients that are certified gluten-free and eco-friendly. The products are also free of silicone, dyes, isopropyl alcohol, parabens, and methyl salicylate. Be cautious if any products you are using contain any of the following ingredients as there are possible health effects. Please ensure that you consult a healthcare professional prior to use. Methyl Salicylate has similar effects to aspirin and other blood-thinners. Products containing methyl salicylate should not be used for more than 7 consecutive days and should not be applied to skin that is warm or hot. Warm skin will allow excessive absorption of the product into the blood stream. Overuse of this product, or when used in conjunction with other medications such as blood-thinners may lead to a buildup of methyl salicylate in the blood stream. This buildup can lead to overdose, kidney failure, difficulty breathing, convulsions, and on some occasions, death. There has been at least 1 documented case in the United States of a methyl salicylate overdose leading to death. Used in many topical analgesics to add colour. Dyes may stain clothing, skin, and can cause irritation. Currently, there are concerted efforts to ban the use of dyes in food and topical preparations. Used in some products to thicken the solution and enhance glide. This inexpensive product blocks pores, can trap bacteria, and cause skin dryness and irritation. Known most commonly as rubbing alcohol. Used in some products to keep crystallized menthol in a liquid state. It is produced by combining water with propene. This ingredient can be toxic, instructions on bottles mention not using on large areas of the body, or for more than one consecutive week as it can cause damage to the colon, kidneys, liver, skin, and central nervous system (CNS). Isopropyl Alcohol evaporates very quickly on the skin, producing an instant cooling sensation. The formula remains at skin surface level as isopropyl alcohol does not allow the product to penetrate deeper into the tissue. CryoDerm uses denatured grain alcohol, a natural ingredient. This form of alcohol does not evaporate as quickly as isopropyl alcohol which is why the cooling sensation of CryoDerm may takes a minute or two to activate. The benefit of using denatured grain alcohol is that the product is able to penetrate deeper layers to provide thorough relief.